The median price of an existing single-family home hit $795,000 in Orange County last month, an all-time high for a slice of housing that represents almost two-thirds of the local market, the California Association of Realtors reported Tuesday, June 20. The report is a preview of CoreLogic’s housing market report on all housing types, which is due Wednesday. A preliminary report released Friday shows CoreLogic probably will confirm the trend, with existing houses and prices for all housing types hitting record highs. Last month’s house-price median — or price at the midpoint of all sales — was up 8.6 percent from May 2016, CAR figures show. House sales were up 5.9 percent year over year. The previous record was $775,424 set in June 2007, CAR records show. At $775,000, April’s median house price came just shy of beating that record. CoreLogic figures show prices for existing condos, new homes and all homes combined already have returned to pre-recession levels. The existing house price had been the only part of the housing market to reach that milestone — until May. 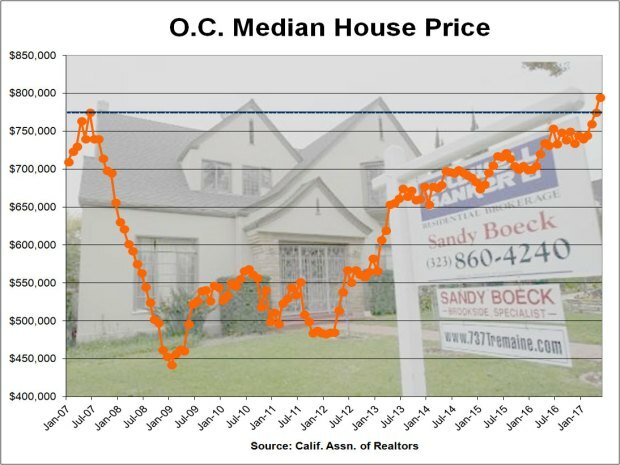 When adjusted for inflation, however, Orange County’s house price remained 15 percent below CAR’s June 2007 price peak. The median price statewide was $550,200, up 5.8 percent, the state Realtor group reported. CAR attributed last month’s strong sales and house prices to the lowest mortgage interest rates since November and strong buyer competition for an unusually low number of homes for sale. Please contact SoCal Life Realtors for all your real estate needs!